No "flower" on the headstock but the TRC is different from the one in my pic and looks a bit like the chineese ones, but there seems to be only 2 screws. I think that TRC is legit for MIJ. Do the Chinese versions have orange labels inside too? Do the Chinese versions have orange labels inside too? That was exactly what I was talking about in my previous message, this have a two screws TRC, probably replaced by a bell-shape one. It would be interesting to know if they are evenly made by Tokai (with the shape of the square in the pickup cavities per exemple). 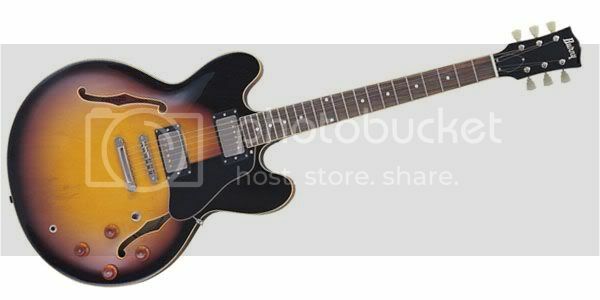 Early 2000, there were ES-110 model so it's approxymatly the same price at this time. I think that for this price they are urethane finish. 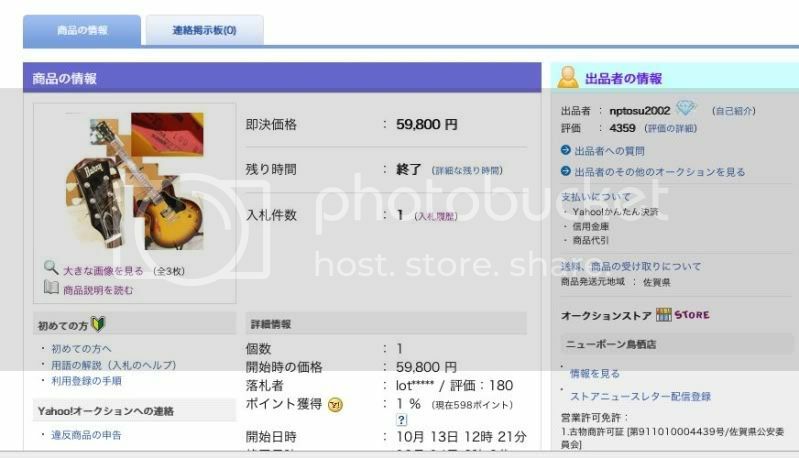 It would be impossible to sell a Japanese made 335 for 50000yen new even in Japan. The salaries and everything are too high for that. Those on Ishibashi are Made in China. If you look carefully you can see that the bellplate is attached with two screws, however, look even more carefully and you'll notice that the lower screw is decentralized. Basically, one screw (out of three) has been removed or fallen off. No, I'm shure...I've seen Burny LPs mij from the early 2000's with this two screw TRC. If the model is RSA100, so the price was 100000Yen !?... No ?! I am absolutely sure it is just de-centered (well, 90% sure ). Not totally unlike the Burny in my pic. 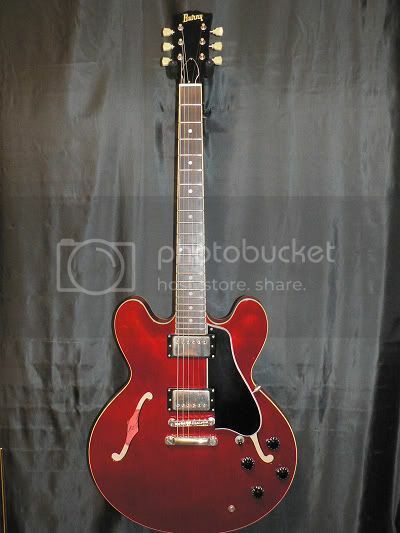 IF this Burny is more or less the same guitar as a Tokai ES100/ES110 it is made in Japan but it?s not nitro as it is a lower model instrument. I'm pretty sure a Tokai built Burny wouldn't have VH1-pickups. I checked the solder joints with a mirror today and everything on the inside is factory installed (impossible to make it that neat and nice unless the top is of). Did you find time to check the finish with acetone? By the way, when you looked at the bottom of the pickups, do you remember if the routing had this shape of the square in the pickup cavities like in a Tokai? 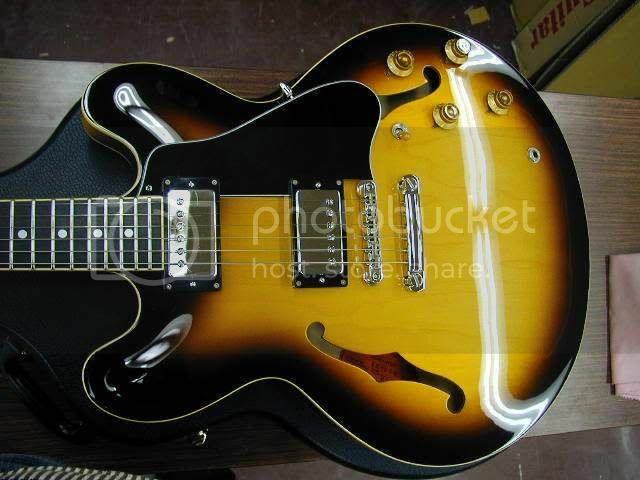 The guitar doesn?t need to have nitro finish as far as I?m concerned. I would love to own an early 80?s MIJ 335, but as long as this isn?t some Chinese fake and the price is right I?m interested. Let me know if you decide not to keep the guitar! There is not really any good place on a 335. The finish is very thin and that is what matters most. Check your email about the Greco SA800!! Under one of the p/up rings would be about the only place. This one obviously sold for 59,800 yen which seems logical as the price new is said to have been around 100,000 yen. I am terrible sorry such inconvenience. However I will inform you the condition of the guitar first. If you still would like this model, I put you on waiting list. -Some scratches and dents could be seen. -Hardwear parts looks clondy, they are dull and a little rusty. -Fretwear could be seen, especially low position. -Serial number is "0212021", this model might be made in Japan. I suppose we?ll never know about the origin of these so called RSA100 Burnys.